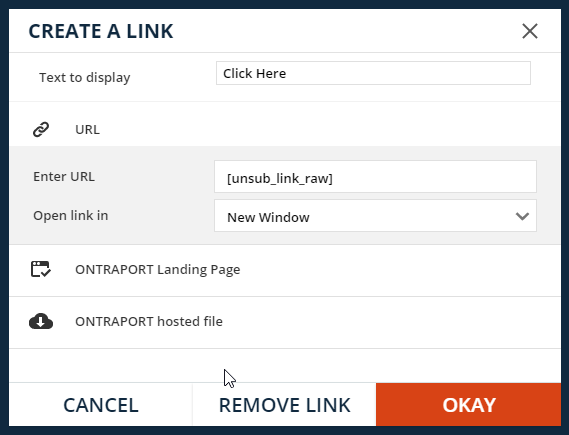 A Merge Field is a placeholder that, when inserted into ONTRAPORT Messages and Landing Pages, merges variable data pulled from the fields of your Contact Records. Merge Fields allow for personalization of your Messages in that you can include a Merge Field for [First Name] in one email, send it to 10 different contacts, and have the field populate with each contact's respective first name when they receive that email. So if you send the same email containing the 'First Name' Merge Field to both Vanessa and Kevin, Kevin's email will say "Hi Kevin" while Vanessa's will read "Hi Vanessa." Merge Fields are found in a dropdown menu in the Message Editor and Landing Page Editor. For the most part, Merge Fields appear in the editor as the name of the Field you’re merging surrounded by brackets. When you select the First Name field, it’ll appear in your content as [First Name] and so on. Below you'll see what the Merge Fields look like in the ONTRAPORT Message Editor and then what those same Merge Fields look like when received by someone in an email. What are Default Merge Fields? The values you set as Default Merge Fields will merge into Messages and Landing Pages when a particular field value in a Contact Record is blank. This comes in handy when you don't have values for all your contacts for all the Merge Fields you're using in your Messages and Landing Pages. All default Merge Fields are blank until you customize them. This means that if you send someone an email with a Merge Field that isn’t yet populated in their Contact Record, instead of inserting any data, that field will show up blank in the email they receive. 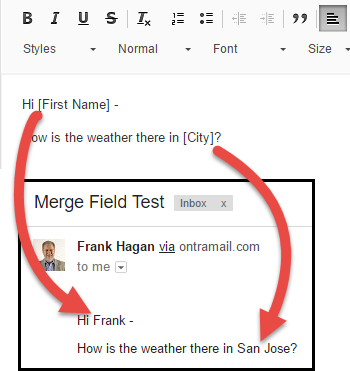 If a Contact does not have a first name stored in their Contact Record, and you send an email using the merge field in the salutation, such as "Dear [First Name]," the merge field would appear as a single space in the email. This makes an awkward salutation such as "Dear ,". If you entered "Friend" as the Default Merge Field value, the blank value would be replaced with "Friend", and the salutation would be "Dear Friend,". Personal Coupon codes with variable time limits, such as "Good for 3 days", have the timer start with the merge field is first produced by ONTRAPORT (when an email is first sent). 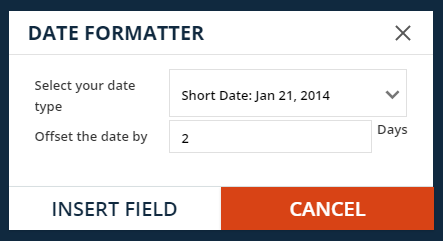 Date merge fields have "date math" that can be applied in the merge field dialog box, allowing you to add or subtract days from the date. You can write things like "Offer expires two days from now, on [nDate abb+2]!" and have it render as "Offer expires two days from now, on Jan. 30, 2018!" for messages sent on Jan. 28, 2018. See Formatting Merge Fields for more information. Month - The month the email was sent. Send Date - The full date the email was sent. WordPress membership details such as password, user name, status, etc. As a relatively new Ontraport user I find myself very frustrated with your help search function. When I search for help on a specific need (like how to insert a first name merge field into an email using the editor) I get a lot of general items in response that require me to slog through them in hopes of possibly finding my answer. I feel like I'm looking for a needle in a haystack. It is very time consuming and seldom yields the answer I need in a timely fashion. Last night I tried using the chat function in hopes of getting a quicker answer but my Ontraport account locked up and I was thrown out before I could finish the chat session. Thank you for letting me share my frustration with Ontraport.